Can you walk me through your exact steps to reproduce this error? What commands did you use to view wireframe in PIE and in packaged game? Hello Adam, thanks for reply! Material is does not matter(But it is a pure unlit with single color in emissive material), I get same mesh error even with default material. 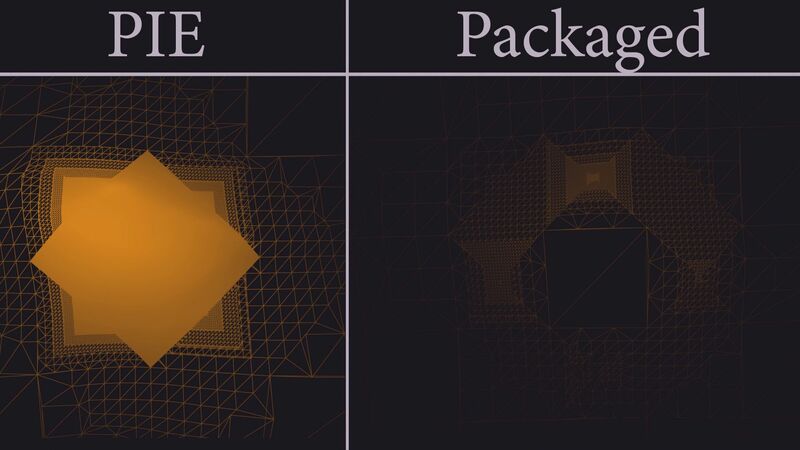 As I said, if I change LODFaloff back to Linear - I get good results in PIE and Packaged game both. The car and the character's collision with the landscape is correct but because of the LOD issue the surface looks below it's expected height. And there is an uglier artifact in the distance as i move. How big are the landscapes you are using? Unfortunately I am not seeing this on my end, Do you have any additional steps I can take to reproduce this effect on my end? It's on Windows 8.1, with UE 4.5.1, Blank project/DesktopQuality/NoContent, Create Landscape - Default flat. Then the only settings I change - MaxLODLEvel: 5+, LODDistanceFactor: 5+, LODFalloff:SquareRoot. Then package for windows - viola! I tried to do the same on second PC - same result. Maybe I should send you archive with both project and packaged version? If you have a project that you don't mind sharing I would be happy to take a look.